As I wrote about in previous posts, one of the goals of recycling the brick from our garage was to be able to use it on our new foundation. 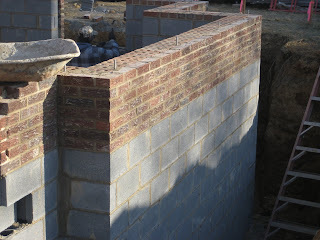 As you can see from the pictures, the new foundation looks great withe brick and will really help visually tie our new addition to the original house. The hard work will certainly pay off - we hope. There are more pictures in the Construction Photos on the left. The schedule for the rest of the week is to finish the foundation and seal it for waterproofing. The next steps will be to put in the steel beam, probably on Friday (unless it's really raining). And then the floor will be poured early next week and the floor joists for the first floor will be put in. After that, framing will begin on the first floor and the garage.